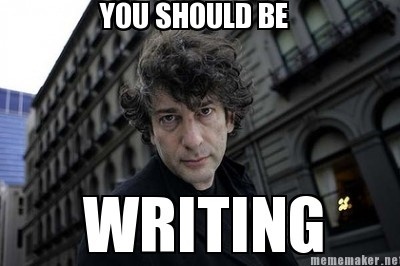 I don’t know who created this Neil Gaiman meme, but I need it pinned in every room in my house. When you go to an author’s website, what sort of things do you expect or want to find there? What do you not want to see? I just stole your fantastic meme. On an author’s website, I want it to be easy to navigate, the books front and centre, a bio and perhaps a blog of what they are writing now. I don’t want a lot of links. I only wish I could give proper credit to whoever created the meme. Glad you like it too. And thanks for your answer! It’s nice to get a view of the author and not just the book(s) when you go to a website. I know some writers prefer to stay dark and mysterious when writing and give little away except where they’re currently up to but maybe I inherited a nosy gene. If a writer has a website then presumably they’ll be doing some promotions maybe even some Author Interviews but I like to learn what they’ve been up to that week and how it’s affected their writing. I like to get a taste of what they enjoy. Thanks for the reply. I’m looking forward to seeing what I end up here.